Amy Butler, Tiffany Hayes, Carrie Nelson, & Monique Dillard Chat with Pat + my Weekly Deal! Amy Butler, Tiffany Hayes, Carrie Nelson, & Monique Dillard Chat with Pat! I’m delighted to have Amy Butler back on the show. I want to find out about her newest fabric line called Soulmate which is a gorgeous cotton poplin with incredible prints. I had a chance to see this line made into so many projects at the trade show, including a gorgeous dress Amy had on. She & her husband/business partner David also travel a lot to host events. I want to chat about how her travels make their way into her fabric lines, projects and maybe influence her life. VISIT Amy, you will find her free Blossom magazine there, it's wonderful! Tiffany Hayes of Needle in a Hayes Stack creates fun and inspiring quilt projects. She is also a clever designer with her fabric placement and her clever Goddess Tool! Listen to find out what THAT is! BUY Tiffany's awesome kits & Patterns! The talented Carrie Nelson of Miss Rosies is here to chat about the Cake Mix and other great things going on at Moda! I am now IN LOVE with Cake Mix papers.. Carries explains it all! BUY Carrie's Newest book at 34% off right now, photos of the inside at the link! Monique Dillard of Open Gate quilts is a regular contributor to APQ magazine, a teacher, author, fabric designer and craftsy instructor. She has been working recently with solids & ombre fabrics to create stunning quilts, we are going to get a few tips from her today! BUY my Favorite Kit of Moniques! BUY her other kits, there are some great ones on SALE! The Camper Quilt Pattern is 50% off..I know you have been looking at it, so fun! BUY HERE while they last! A spin around my Studio... and tell me which YOU'd pick! The Sew Sampler this month is SQUEAL worthy!! I know EXACTLY who I'm making the fish quilt for, don't you love when that happens? And luckily I 'collect' solids and tonals JUST for this very reason.. Open, press, cut, sew! The awesome magnifier, I put it to use RIGHT away! DARLING Fabric, called Reef, perfect for me!!!!!!!!!!!!!!!!!!! and the pattern that is exclusive to club members..
Plus the club's exclusive discount codes.. like a secret handshake, but better! and the wee little school of fishes... yes! And the magnifier is truly awesome.. you need one! Next up you are going to get to hear about my OBSESSION... PASSION... Crazy LOVE of Novelty prints! I am getting the quarterly Cotton + Steel club. I can either save the fabrics for my own project, or the club is given an exclusive pattern to use. Yes.. MORE FISH!!!! And darling ring tails...a lagoon, ... super cute animals & more! Which solid Should I use? leave me a comment! They also come in Gold.... because.. they can! AND I did it, I ordered the UNICORN Scissors. you need them too.. right? the Layer cake of this fun fabric is on FLASH Sale for 55% OFF! AND Tues Aug 29 .. Gregg and I are going to the VA Quilt Museum to hang my exhibit! On Tuesday I'll pop in several times to update you and show you how it all goes together! Thank you so much for being part of my community! If you are new here, sign up for my notices and you'll never miss a thing! Charity Sew Along Block #8 - we are Rolling along this month! This is my 3rd year making a quilt to be auctioned for Charity. It's an honor to do this and I am partnering with the Fat Quarter shop & Moda fabrics to raise money for Make a Wish this year. The Patchwork Quilt Along is a year full of quilting fun for a great cause! PLUS darling blocks that I'm doing in a totally different colorway than the original. 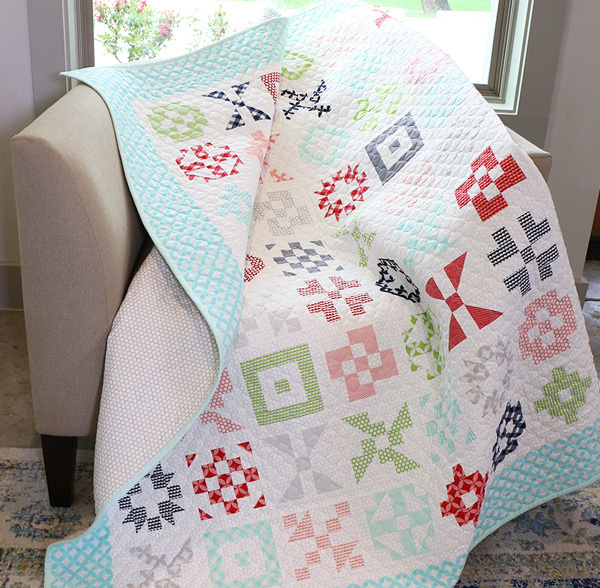 If you love this exact quilt you can find Order the Patchwork Quilt Kit & Backing! I did a vote at my online group... the binding is not on yet.. Which do YOU think? Leave a comment below! And I am keeping my blocks tidy with wonderclips & the little Alphabitties numbers & letters!